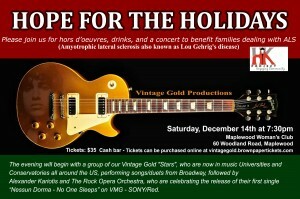 HK Project and Vintage Gold Productions is hosting a benefit concert, "Hope for the Holidays", to raise funds for families dealing with ALS (Amyotrophic lateral sclerosis, often referred to as Lou Gehrig's Disease). HKP has partnered with Vintage Gold for two very successful benefit concerts in the past and it is our honor and pleasure to do so again, especially since this will be HK Project's final sponsored event before we close our doors. PLEASE HELP US GO OUT WITH A BANG!!!!!!! The concert, "Hope for the Holidays", will take place on Saturday evening, December 14th, 2013 at the former Maplewood Woman's Club, 60 Woodland Road in Maplewood, NJ. Doors open at 7:00pm. Tickets are $35.00 and include passed around hors d'oeuvres (masterfully prepared by Blue Plate Special's Laura and Dan). There will also be a cash bar (beer and wine). In addition to selling tickets to this concert we hope to to raise an additional $2,500 to support families who deal with the significant costs associated with caring for a family member afflicted with ALS by using umojawa.com, a crowdfunding platform for non-profits.